Very frequently we have heard this from many Apigee community members on how to customise Apigee Developer Portal and change look & feel. I believe putting all things in one article will help lot of them. Let's see various scenarios related to this particular task. Make sure you have Administrator Access to Developer Portal. You can verify this by logging into developer portal and look out for Administrator Menu on top of screen. See screenshot below for example. You can refer detailed documentation in our Apigee Docs which explains how to change these colors using an admin configuration screen. 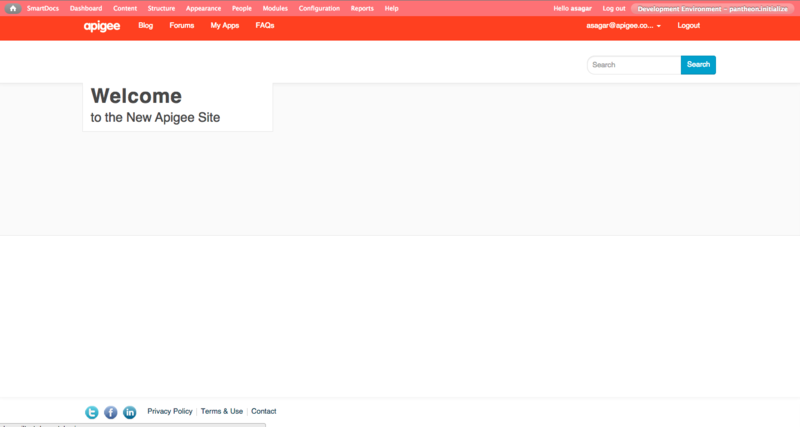 Blocks in home page are enabled using Drupal Context module. You can able to remove or add new blocks using configurations screens provided by Context module. Let's see how to remove these blocks from home page. 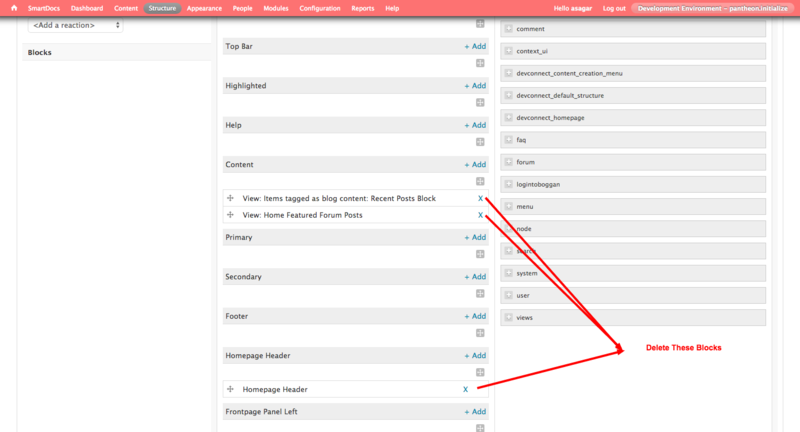 Navigate to Structure -> Context page to see list of contexts using admin menu. You will see screen like below. Click on Edit link next to home context. You are navigate to screen where home page related contextual actions can be managed. Click on Blocks to see list of Block Activated. Click on remove icon next to block to remove them. You can also drag and drop new blocks from blocks list on right side. Click on Save button at bottom of page once you are done with your changes. Navigate to home page to see changes. See screenshot below where i have remove all the blocks from context home. Ideal way of doing this is changing the html using template files inside your theme. Unfortunately, this is not possible for free Apigee Developer Portals. 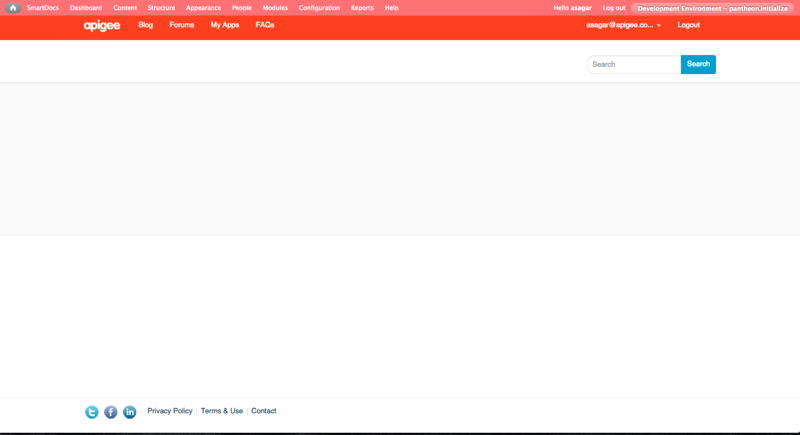 If you are paid customer, you can able to do this by changing the theme template files by accessing code base. For free customers, there is a way to remove this text by using css. Switch off Rich Text Editor under block body and make sure text format is 'FULL HTML'. Write your css inside body using style tags, save the block and Enable the block in home page only. You can either use block settings to display block in a particular page or use Context way of displaying blocks as explained above. See settings here in screenshot. See results here after removing home page welcome text from home page. 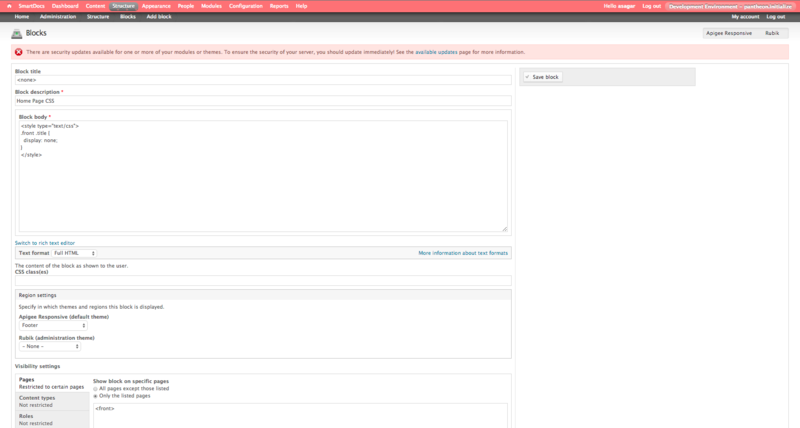 Similarly you can add additional css to any page. If you are paid customer and have access to code base then you write css inside your theme css files.